Why Are Women Shut Out of Peace Talks? UNITED NATIONS, Nov 27 2012 (IPS) - Against the backdrop of an upcoming U.N. Security Council (UNSC) meeting on women, peace and security, a coalition of some 63 international women’s groups and non-governmental organisations (NGOs) has decried the absence of women during peace negotiations in post-conflict situations. In a letter to Deputy Secretary-General Jan Eliasson and Under-Secretary-General Michelle Bachelet, executive director of U.N. Women, the coalition says of the nine peace agreements that were signed last year, only two contained women and peace and security provisions. Furthermore, out of the 14 peace processes that were underway in 2011, only four of the negotiating party delegations included a woman delegate. 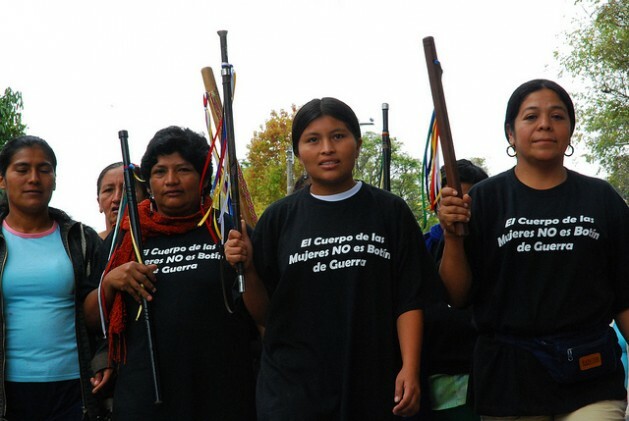 The coalition, which includes the Global Network of Women Peacebuilders (GNWP) and the International Civil Society Action Network (ICAN), has specifically expressed “deep concern” over the absence of women at the negotiation table in the current peace talks between the government of Colombia and the Revolutionary Armed Forces of Colombia (FARC) and the ongoing transitional political processes in Mali. Mavic Cabrera-Balleza, GNWP’s international coordinator, told IPS that Secretary-General Ban Ki-moon’s 2012 “Report on Women, Peace and Security” has already highlighted that words and resolutions have not been translated into actions. She said sexual and gender-based violence (SGBV) is both the root cause and consequence of women’s lack of representation in decision-making. “This scourge will only continue if women are not part of the decision-making. Women will always be vulnerable if their strength and leadership is not acknowledged and valued,” she added. On Friday, the UNSC is expected to discuss the implementation of its landmark resolution 1325 adopted in 2000, which was primarily aimed at integrating gender into its core mandate: the establishment and maintenance of international peace and security. Cora Weiss, president of the Hague Appeal for Peace and U.N. representative of the International Peace Bureau, told IPS it is time for the UNSC to have a small working group to vet all of its resolutions for their impact on and participation of women. She said UNSC Resolution 1325 has gotten more attention, and more lip service than most other resolutions. “Everyone talks about women. But where are we?” she asked. Weiss called on the secretary-general to appoint a woman to a permanent office on women’s participation in peace processes. Ambassador Anwarul K. Chowdhury, who presided over the 1990 UNSC meeting and was the prime mover of the 1325 resolution, has since helped bring to global attention “the unrecognised, under-utilised and under-valued contribution women have been making to preventing war, to building peace and to engaging individuals and societies live in harmony”. But he has continued to warn that the historic and operational value of the resolution has been undercut by the disappointing record of its implementation. Cabrera-Balleza told IPS the progress in 1325 implementation has been slow and inconsistent. For example, 12 years on, there are only 38 National Action Plans on 1325, a mere 19 percent of the 193 U.N. member states. “And why are governments not using the indicators developed under Resolution 1889 (adopted in October 2009 which included follow up indicators to Resolution 1325)?” she asked. “The indicators are not meant to be used to point fingers at who is doing or not doing their work. They are guideposts that will help improve implementation,” she noted. Weiss told IPS right now there are at least two opportunities for peace: Colombia and Mali. The Colombian FARC talks in Havana should have women at the table as an independent voice, not associated with the “sides”. “There are many networks of women in Colombia, they have brilliant, experienced people who have been witness to and victims of the 50-plus year war,” she said. She also said they support the peace process and have reasonable demands, such as no impunity for perpetrators of sexual violence. Meanwhile, she said, the tragedy in Mali will see a six to 12 month process for rebuilding its military, and a parallel peace process. “Where are the women in that process? We are told the ‘political forces’ will be at the table,” she said. And one of the five permanent members of the UNSC (whose identity Weiss did not reveal) has said they cannot dictate to a sovereign state what to do. “How will states ever carry out the decisions of the UNSC if they are not reminded of their obligations under the Charter?” she asked. Women were told they could not come to the Irish Peace table because it was only set for political parties. So they went and formed a political party and the two women at the table made history and institutionalised human rights into the Good Friday Agreement, said Weiss. “What happens in Colombia and Mali will influence future peace processes. They can be role models,” she said.